As the night falls in Valencia, Spain the stunning lighting at The La Ciutat de les Arts i les Cienies Complex is activated. The city of Valencia has a tasteful mix of old and new architecture. The La Ciutat de les Arts i les Cienies Complex is one example of some the most modern architectural creations in Spain. Each building in the complex is surrounded by large pools of water which reflect the lights and structures. This brand new complex which covers an area of approximately 90 acres of downtown Valencia houses a science museum, Opera and play theatre, Laser show and Imax theatre, and the largest aquarium in Spain and the whole of Europe. A great way to see the many sights of Valencia is by Touristic Bus which travels through the streets of both the historic districts and modern areas. Commentary is provided in several languages and covers the history of Spain and of course the city of Valencia itself. The City of Valencia is situated on the East Coast of Spain and has a Mediterranean climate where during the summer months temperatures average at around 23 degrees Celcius. Valencia is the third largest city in Spain and is famous for the Fallas Festival held each year, its colourful Orange Groves, and elaborate architecture. 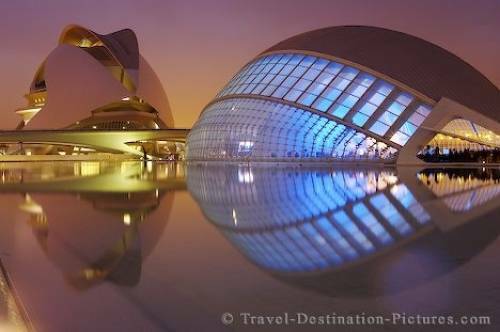 Picture of the impressive L'Hemisferic and Palau de les Arts Reina Sofia in the city of Valencia, Spain, Europe.